Happy Dr. Martin Luther King Jr. day! Is it okay to say “happy” MLK Day? I mean, he was a martyr, so is that really appropriate? I don’t know. But I do know I want to mark the day not just by sleeping in and goofing off, but by really thinking about and remembering this great man. 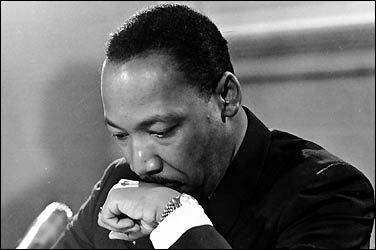 So I was very pleased to find a story about how Dr. King turned to prayer at a particularly dark time in his life. The story appears in Standing in the Need of Prayer: A Celebration of Black Prayer and was written by Coretta Scott King. You can read it on Beliefnet.com.